Just some days ago we won the UK Search Award for Innovation Software. This puts the cherry on top of an amazing year. And while we are preparing ourselves for an adventurous next year, we want to take a look back. We were already off to a great start, when we won the SEMY Awards in Germany as the best specialized SEO tool in March 2016. And spring got even better, when our personal Easter egg was a place on the shortlist of the EU Search Awards in the category Innovation Software. And while we worked hard in summer, especially all around the data of the mobile SERP, fall exceeded all our expectations. Moving from being shortlisted for the US Search Awards, we eventually won the Award as most Innovative Software in the US. But, only one week later, we were nominated for the UK Search Awards. So, while viewing Google’s moves to a mobile first index and starting our christmas preparations, we got an early gift as we won the UK Search Awards as prime Innovation Search Software in the UK. Winning the triple subsequently makes us one of the front runners in Germany, the UK and the US. This makes us very proud. And we could not have done it without the continuous feedback from our loyal customers, the help from our partners, the recognition of the judges and all the outpouring support from our friends. Thank you all for believing in us. You are the reason we strive to advance into an even better 2017. We will innovate further and we will make sure that you will have an even more awarding experience with the Trisolute News Dashboard in the coming years – so off we go to a great start in a happy new 2017! 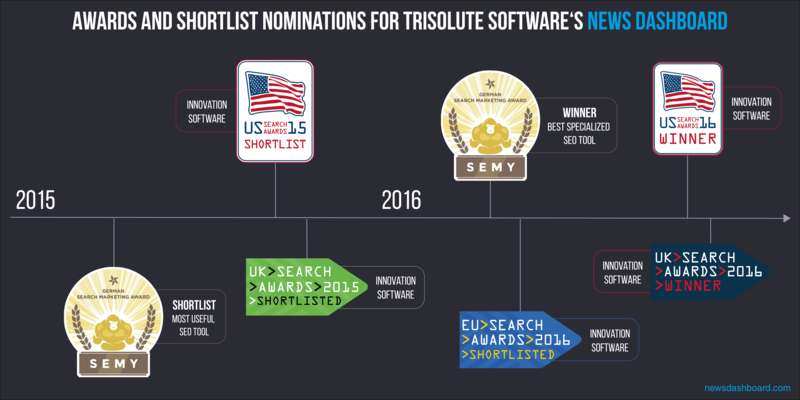 The Trisolute News Dashboard wins the Triple of Search Awards in 2016.